Here's a better look at the card.. I used an A2 Crumb Cake cardbase. I added a 4 1/8" x 5 3/8" piece of Chocolate Chip Cardstock on that for a thin layer. 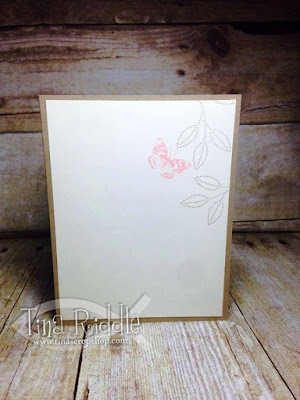 The top layer is a 4" x 5 1/4" piece of Blushing Bride cardstock that was embossed with a Woodgrain Embossing folder and sponged with Crumb Cake ink. I added some Crumb Cake splatters as well and then I distressed some of the edges by peeling them back. I added a Brown piece of Seam Binding along the left side of the top layer before adhering it to the other layers. I attached a Brown Seam Binding bow and some Linen Thread loops to the bowl. I used my Lots of Label Framelit Dies to cut a Crumb Cake Label and a larger Chocolate Chip Label. 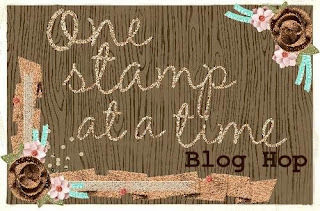 I stamped the Crumb Cake Label with the leave stamp from the Grateful Bunch in Crumb Cake and then added the sentiment "You are loved (A LOT)" stamped in Chocolate Chip Ink. I sponged the edges of the labels Tone-on-Tone. 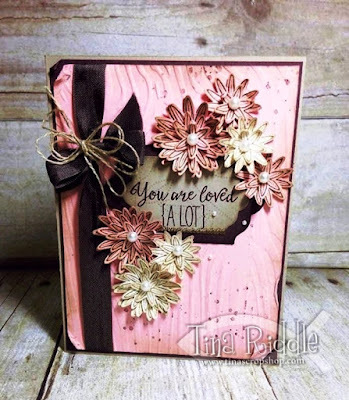 I glued the labels down and then added flowers stamped with the Grateful Bunch stamp set in Soft Suede onto Very Vanilla and Blushing Bride Cardstock. I sponged all of the edges and then used my Bone Folder to curl the edges up. I layered them using glue dots and adhered them with glue dots as well. I added basic pearl jewels in the middle of the flowers and even scattered a few on the card front. Here is the inside of my card.. I decided to keep the inside simple. The inside was a 4 x 5 1/4" piece of Very Vanilla Cardstock. I stamped two of the leaves in Crumb Cake Ink and added the butterfly in Blushing Bride. Both of these images are from the Grateful Bunch Stamp Set as well. The frame was just a $1.00 craft frame from Michael's and I love the way it turned out. I will probably add a picture of my new little granddaughter, Blakely Addison Rose! 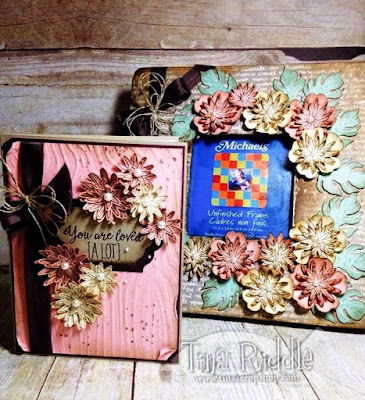 I used Modge Podge to cover the craft frame with Tip Top Taupe DSP from the 2015-2017 In Color Designer Series Paper Stack. After the glue had dried I sponged the edges and distressed it some with Soft Suede Ink. I used some Brown Seam Binding along the left side with a bow and some loops of Linen thread. My flowers from the Grateful Bunch were stamped in Soft Suede Ink and punched from Very Vanilla and Blushing Bride Cardstock. I also added a Pansy Punch cardstock layer behind some of the flowers and sponged it as well as the other flowers. I also used my Bone Folder to curl up the edges of all of the flowers before assembling with Dimensionals. The leaves from the Botanical Blooms stamp set were stamped Tone-on-Tone with Mint Macaron Ink and Cardstock and sponged with Soft Suede Ink. 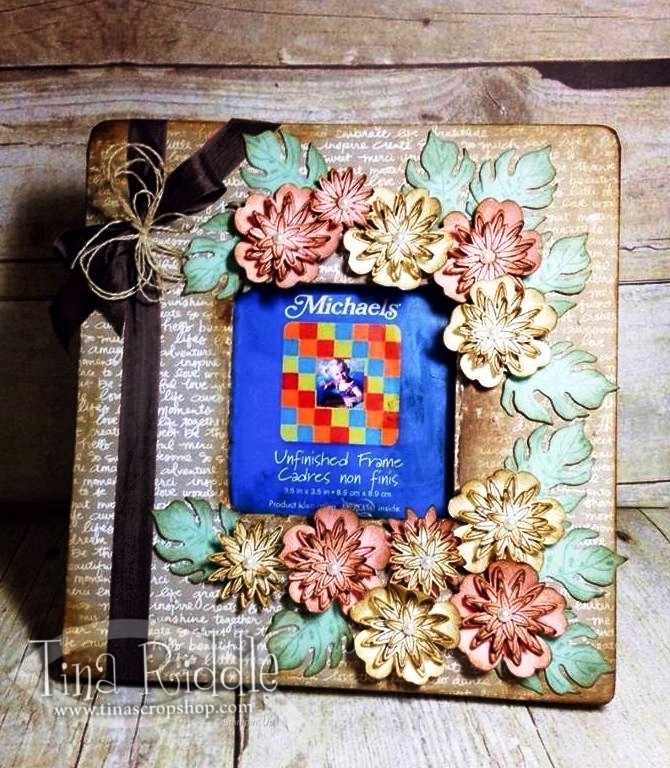 The flowers were added onto the frame with Foam tape and the leaves were adhered with glue dots. I finished off the flowers by adding more Pearl basic jewels in the center! Next up on the hop is the Amazing Melissa Davies! Just click the next button and you'll be there! Here's a list of all of our fabulous bloggers in case you've lost your way! 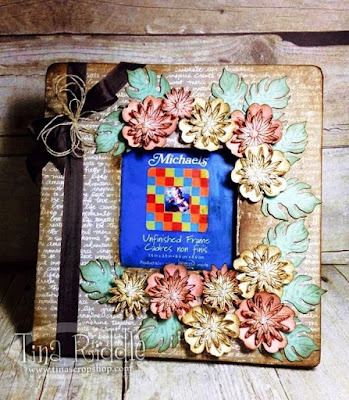 Beautiful card and frame, so pretty. WOW!! GORGEOUS! Sponging really looks amazing! Now you need the perfect picture for your lovely frame. Thanks :) I'm pretty sure I'll put a picture of my sweet grandbaby! ok, so that frame is STUNNING in photo, so I can only imagine how beautiful it is in real life!!!! Looks perfect for a grandbaby photo! Wow, wow! Fabulous as always Tina! Beautiful projects Tina! Your color scheme is perfect for the shabby chic theme. Love the bunches of beautiful flowers you used.